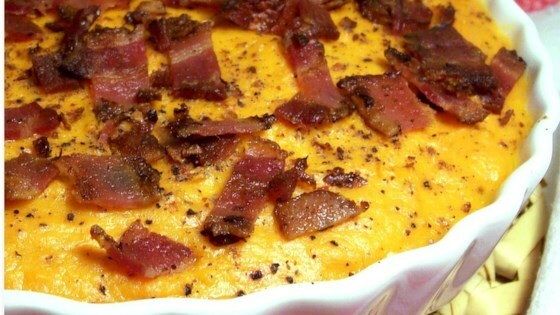 "Bacon makes a great topping instead of marshmallows for this Thanksgiving family favorite!" Preheat an oven to 325 degrees F (165 degrees C). Grease a 2-quart baking dish; set aside. Place the sweet potatoes into a large pot and cover with salted water. Bring to a boil over high heat, then reduce heat to medium-low, cover, and simmer until tender, about 20 minutes. Drain and allow to steam dry until cool enough to handle. Meanwhile, place the bacon in a large, deep skillet, and cook over medium-high heat, turning occasionally, until evenly browned and crisp, about 10 minutes. Drain the bacon slices on a paper towel-lined plate. Chop the bacon coarsely; set aside. Slip the skins off the potatoes and discard; blend the potatoes in an electric blender or food processor until smooth. Stir in the butter, cinnamon, nutmeg, cream, and milk. Mix well; season to taste with salt and pepper. Spread the potato mixture in the prepared baking dish. Bake in the preheated oven until heated through, about 18 minutes. Remove from the oven; sprinkle the potatoes with the bacon. Return to the oven and bake for an additional 5 minutes. Didn't like, sorry. Needed more flavor. Maybe sauteed onions. My husband and son didn't like it either. Excellent - Took it to a potluck - it was the first dish gone! Works well when you have diabetic guests or people trying to avoid sugar. Very nice change from the too sweet, sweet potatoes. Easy to do. Even grandchildren like this! Wow! It's become a family favorite. I made the recipe just as is with no modifications and it was great.